Montevideo is the Netherlands' tallest residential building. 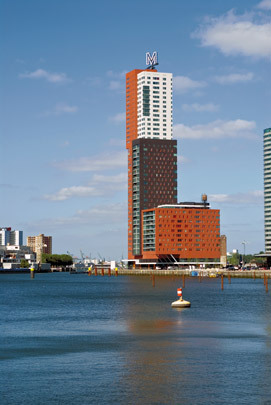 Designed by Francine Houben of Mecanoo (1999-2006), it is intended as a counterpart to the World Port Center on the other side of Hotel New York. Its parts are variously given over to loft, city, sky and water apartments, 192 in all. Not so much apartments as stacked houses, they all boast home automation facilities that include numerous resident services. They share the tower with 6000 square metres of offices, 1900 square metres of shops and restaurants, a health club and a terrace for the residents. All in all, Montevideo is something of a vertical city.